The ability for you to maintain control over the direction of your investments is extremely important. For that reason we have created a retirement plan that encompasses almost every level of risk, and which enables you to change your asset mix as your risk tolerance or age changes. 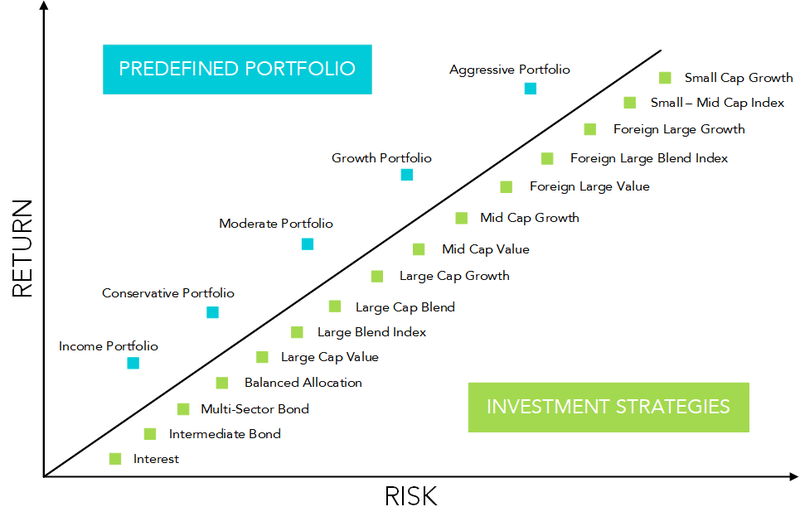 The chart below depicts the categories of our funds in a simplified Risk vs. Return model. If you don't fancy yourself a financial expert, consider that most financial planners would strongly suggest investing in a predefined portfolio with a specific asset mix that matches your current risk tolerance (not to be confused with Target Date Funds — please see the White Paper on Target Funds at the bottom of this page). Our retirement plan offers five such predefined portfolios, all created by our advisors at CAPTRUST Financial Advisors. Each portfolio, which is comprised of a mix of stock funds (equities) or a combination of stock (equity) and bond (fixed income) funds, is rebalanced once a year to ensure the asset mix stays true to its intended risk tolerance. CAPTRUST has provided a suggested age range for each portfolio along with a custom questionnaire to determine correct fit based on personal risk profile. These portfolios are as "turn-key" as it gets. Your personal investment guru is available to you 24/7 thru AdvicePlus. For an example, see the AdvicePlus PDF at the bottom of this page.